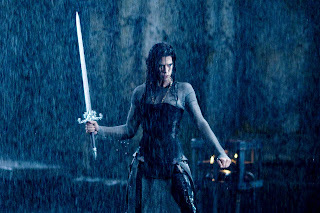 Cam's Cinematic Episodes: Film Review - UNDERWORLD: RISE OF THE LYCANS: A Bloodless Vampire/Werewolf Prequel Without Any Bite. 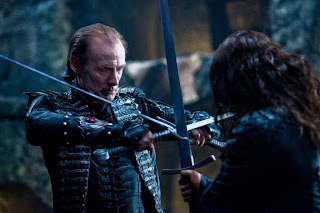 Film Review - UNDERWORLD: RISE OF THE LYCANS: A Bloodless Vampire/Werewolf Prequel Without Any Bite. 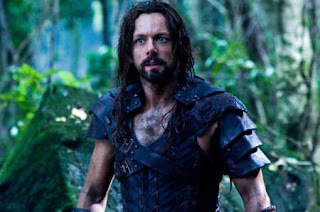 Sadly, Beckinsale is largely absent from the series’ latest turgid entry, Underworld: Rise of the Lycans, which ins tead shifts its focus towards the Lycan’s tormented leader, Lucian, played by Frost/Nixon and The Queen star Michael Sheen. Set in the Dark Ages, during a tumultuous time where vampires and Lycans battled for ruler-ship of the free-land, Rise of the Lycans begins in flashback, describing the miraculous birth of Lucian, a Lycan of unique attributes. 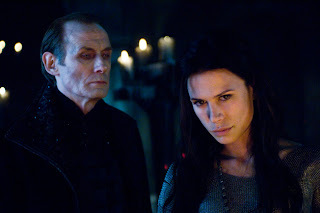 Bearing a human appearance and rational mind, with little of his brethren’s uncontrollable bloodlust, he was adopted by the vampire lord Viktor (Bill Nighy), and used to breed a new race of subservient Lycan slaves. Nevertheless, after defying orders and rushing to the aid of his secret lover Sonja (Rhona Mitra), who happens to be Viktor’s warrior daughter, Lucian is relentlessly whipped and imprisoned, thus losing what little freedom he once possessed. Under the threat of having his illicit love affair with Sonja revealed, and spurned by the suffering of his fellow werewolves, the reluctant leader doggedly plots to unite his Lycan people and lead a brutal rebellion against Viktor’s malicious forces in a last-ditch quest for freedom. 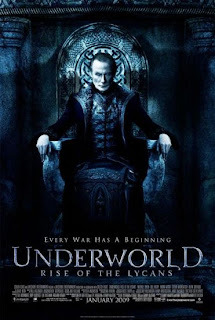 Curiously, despite a 35 million dollar budget, and an occasionally ambitious story featuring epic confrontations and dramatic revelations, Underworld: Rise of the Lycans comes across as a di sastrously small-scale bore, seemingly lifted from a Direct-to-DVD pile. 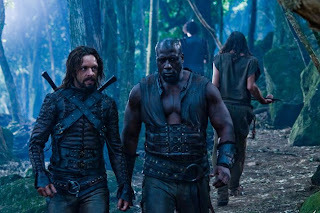 With shoddy production values, which apparently required that the film be staged almost entirely on a single location, or frequently jerky creature effects work, Rise of the Lycans seems less inspired by its forebears than by an obvious determination to become a bargain-basement supernatural rip-off of Spartacus. Undoubtedly aware of his film’s shortcomings, Patrick Tatopoulos, a novice director taking over for the series’ founder Len Wiseman, attempts to mask the limited resources available to h im by shooting the entire movie through an annoying foggy blue lens filter, and editing his action scenes into mish-mashy collages of Lycan fur, shining steel blades and more blood-splashed stone walls than you can shake a broadsword at. While there’s absolutely nothing wrong with attempting to over-come budget constraints, Tatapoulos, in the process, has forfeited any sense of visual coherency or flow, making the film’s numerous climactic clashes about as exciting as staring a flickering screen-saver. To make matters all the worse, Rise of the Lycans is a dour affair, taking its ham-fisted story and limited character development deadly serious at all times. While Bill Nighy manages, perhaps as a private joke, to camp up his later dramatic scenes in a last-ditch attempt to entertain, poor Michael Sheen - a dead-ringer, with his flowing locks and bugged-out eyes, for System of a Down guitarist Daron Malakian - is straight-jacketed by his goofy role as a lycanthropic Jesus figure (Passion of the Lycan would have been a more suitable title). When not being scourged to a pulp, the actor is forced to endlessly holler unspeakably awful lines such as “We are not animals!” and “We can be slaves... or we can be LYCANS!” Sheen does what he can with this flat material, but is eventually buried by the suffocating absurdity of the role. 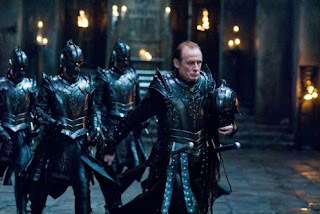 The majority of the blame for why Rise of the Lycans falls apart so badly, and why it ends up being as terrible an experience as it is, lies mostly in the restrictions imposed by its framing device. As it is a prequel, there is an amazingly minute amount of story to tell, and we know exactly who will live or die. Hence, we find ourselves bored to tears by the film’s countless painful dialogue scenes, and waiting impatiently for the inevitable to occur. Excluding credits, the film runs roughly only 85 minutes, and even still feels padded for length, and the ending featuring stock footage intended to clumsily tie the three films together, is just plain embarrassing. The most frustrating aspect of Underworld: Rise of the Lycans, not to mention the entire Underworld series, is that it aims so painfully low. Content to pacify fans with tedious flashes of m indless blood and gore, and resemble little more than an extended PS3 pre-game cut-scene, the film fails to deliver on its kitchsy-cool premise. The filmmakers may have recognized the marketability in pitting vampires against werewolves, but movies as toothless as Rise of the Lycans sure don’t give movie-goers a whole lot to excitedly howl about.